The Tree would be so Proud! Sometimes the Universe has its own means of making its message known. Today our work was chosen based on an article I came across on Facebook, posted by the Museum of the American Indian in Washington, D.C. It is a 19th century ceremonial dance mask made by a Yup’ik carver and eventually purchased by a trader in 1905. The mask’s provenance places it in the collection of the surrealist painter Enrico Donati and is one of several masks purchased by the surrealist collective which, along with other works of African art, inspired the fantastic and the marvelous which were foundational to surrealist ideas. There is much to talk about here in the life of this very powerful object. How many objects can claim having both spiritually supported its creator and its community as well as inspired an entire paradigm shift in art? Such is the valid experience of this object through the course of its life. The biography of this object begins with a dream. A Yup’ik Eskimo angalkut (shaman) somewhere in western Alaska, had a story come to him in a dream which he wished to share with his community. He visited a wood carver and described his story and the appearance of the mask that he was requesting the carver to make for the telling of the tale. The wood carver then took the angalkut’s request and created this mask. He carved the face out of a tree trunk, leaving some of the bark to demark the forehead and chin. He added two hand-like forms to either side of the face and a hollow trunk projecting from its chin. He suspended twigs or bones with string from two carved wooden feather-like forms and added them to either side of the chin. He added another wooden projection from its forehead and hung seven carved wooden feather-like forms from its end. He encircled the head by bending a long, bare branch and attaching it to either side of the chin then placing eight feathers from different birds around the top. He used red ochre to stain the protruding hands and the face (much has worn off, but patches still appear on the nose and around the mouth). The red pigment may have symbolized life or blood and may have offered protection to the wearer during the ceremony for which it would be used. The carver/artist was guided in his design not only by the vision of the angalkut, but also by a canon of standard design features which included the large, toothy grin, the thumbless hands, “goggled” eyes and feather halos. (The Living Tradition of Yup’ik Masks http://www.tribalarts.com/feature/riordan/index.html). Though constrained by these elements, he was also able to bring his own unique and distinctive style to the work which would distinguish the mask as his work alone. The mask would have been kept hidden until it was brought out for the performance. Then (if not made specifically for trade) it would have been worn by the angalkut in a dance expressing the dream story. This may have been carried out at the mid-winter dance ceremony known as the Agayuyaraq. This event marked the final ceremony of winter in which all the local tribes would take part and many songs and dances would have been performed to appease the animal and nature spirits. This particular piece is known as the “mask that brought the south winds” but its story was told only once and is lost to us now. Often masks were destroyed after the performance. However, many were traded and are in numerous collections around the country. The masked dance not only expressed a story, but also functioned like a prayer. The dancer was asking something of the spirits which he was embodying during the dance. Often the dancer was believed to become the spirit, thus the need for the protective red ochre on the mask’s surface. Yup’ik tribal member Andy Paukan explains, “When a shaman made a mask to be presented and composed a song about the mask, he would let the carver make a mask, telling him what to do. When the mask was done he would put the mask on and dance. . . . They were praying. They were communing.” (The Living Tradition of Yup’ik Masks http://www.tribalarts.com/feature/riordan/index.html). Thus the mask in and of itself was not sacred, only that which it represented. It was also ephemeral, being made and used only once for a singular purpose. Once its dance was completed, it no longer held any meaning or function. It’s story, however, would live on in the collective traditions and culture of the tribe. But this mask had a second life. Having lost its meaning and value to the community, the mask was sold to a trader who then sold it to a New York collector, George Gustave Heye, whose collection would make up the bulk of what would later become the Museum of the American Indian. But when the museum fell on hard times, it was sold, along with other masks from the collection to a New York art dealer who in turn sold them to several of the surrealist artists including Andre Breton and Enrico Donati, who purchased this particular mask. Up to this point, the mask had illustrated a Shaman’s story-dream, a message from the spirit world to benefit the Yup’ik community. Now, in the hands of the surrealists, it was imbued with a new life and purpose that would be foundational to changing the way we think about art today. 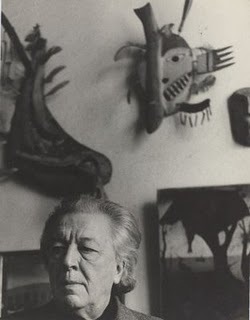 Andre Breton defined literary and artistic surrealism in his Surrealist Manifesto of 1924. “Psychic automatism in its pure state, by which one proposes to express — verbally, by means of the written word, or in any other manner — the actual functioning of thought. Dictated by the thought, in the absence of any control exercised by reason, exempt from any aesthetic or moral concern.” Greatly influenced by the new and exciting world of psychology, as pioneered by Freud, Breton and his fellow surrealists wanted to express pure thought unencumbered by logic, reason and social patterns and norms. They used all sorts of psychology-based methods to get at these ideas and the world of dreams played an important role in revealing this end. Surrealism was part of the attempt, through self-reflection, to shake off the shackles of the appearance of the object, like attempting to wake oneself up from a dream. First the dreamer has to be aware that he or she is dreaming, then the dreamer has to understand the “laws” of the dream world in order to transition to another plane of existence. Breton and the surrealists saw the obsession with the appearance of an object, which had held prominence in art and literature since the Renaissance, like this dream state from which the artist / poet had to emerge. In order to do so, however, the artist / poet had to have some external frame of reference on which to point his sail. Dreams and works of art found in traditional societies, whose appearance was grounded in its purpose and function and not necessarily on some aesthetic ideal of visual replication, were examples the surrealists looked to for inspiration. Thus we find this Yup’ik mask in Donati’s collection. The surrealists would have looked to the form of this mask as an example and inspiration of true thought and as a means to begin to explore the world of ideas outside one’s rational and logical constraints. The mask was a doorway into another world where the imagination was limitless and the marvelous was the only true aesthetic. “Only the marvelous is beautiful” (Andre Breton, Surrealist Manifesto, 1924). So this mask was placed on a wall in Donati’s studio to remind and inspire him to the principles of surrealism. Now, the question remains as to whether Donati, Breton or any of the surrealists had any real understanding of the true context and purpose of this object. If they had, they would have been astonished to find that its own aesthetic form had come from a dream and truly did express exactly what they had wanted it to, i.e. the pure expression of the “soul” whether understood as Freud’s “unconscious” or as the Yup’ik’s spirit world. The mask truly is a message of the universe made manifest and this has been confirmed by two completely different cultures. Of course the legacy of surrealism and modernism changed completely the way we think about art today. Our contemporary consciousness allows an incredibly broad spectrum of aesthetic and conceptual expression. Often today, it’s easier to define what isn’t art rather than what is and we owe this object a great debt in graciously offering itself and its life to this paradigm shift. The tree must be so proud. The story doesn’t end here, though. In 1996, an extraordinary exhibition of Yup’ik masks was presented, not by some academic curators of Native American arts, but by the Yup’ik people themselves. The exhibition was organized by several Yup’ik members along with Ann Fienup Riordan, an anthropologist who has lived and worked among the Yup’ik people since 1973. The exhibition opened first in a small village high school where 1000 Yup’ik visitors viewed the many masks which were brought together from several museum collections. Andy Paukan, one of the Yup’ik exhibition organizers expressed his sentiments about this project. This project is important for me and, I believe, all Yup’ik people, not because it brings the past back to us but because it may help preserve our future. . . . I consider it fortunate that so many well regarded museums have fine collections of Yup’ik materials. Certainly those who collected these items may have thought they were collecting the artifacts of a vanishing culture. However, among those of us whose forefathers were the craftsmen, these items demonstrate that we may be different, but we have not vanished. When I walked through the doors, the first thing I saw was a king salmon mask. How appropriate, I thought. From the salmon carving, I turned to my left and walked through the rest of the exhibition which dazzled my mind. “How ingenious we Yupiit are, ” I thought to myself as I saw a mask from Chevak with moveable eyes. The mask exhibit reaffirmed my Yup’icity. Suddenly I was proud to be Yup’ik. The success of this exhibition can be measured in the pride and ancestral connection it brought back to the Yup’ik people. Though our mask was not among those displayed, it is certainly a beautiful expression of the pride of this rich cultural tradition. The mask is expected to make a record bid of $2.1 million dollars for a Native American work of art. How very insignificant that fact seems to me now having lived in its “shoes”. ~ by fultonm2010 on January 11, 2011.